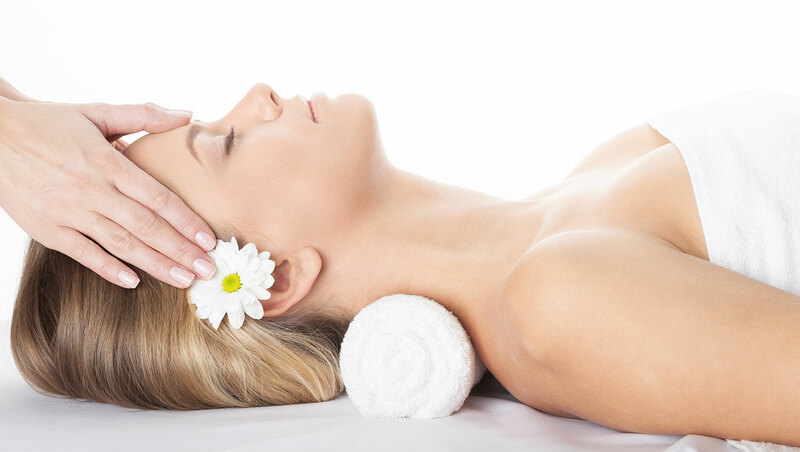 If fun is what you’re looking for, Whittlebury Hall’s day spa is a great choice. This self-contained day spa is in a separate wing from the popular hotel. The main attraction is the heat and ice experience with hydrotherapy pool, hot and cold thermal rooms and experience showers, but there’s also a sizeable swimming pool and classes available in the exercise studio. 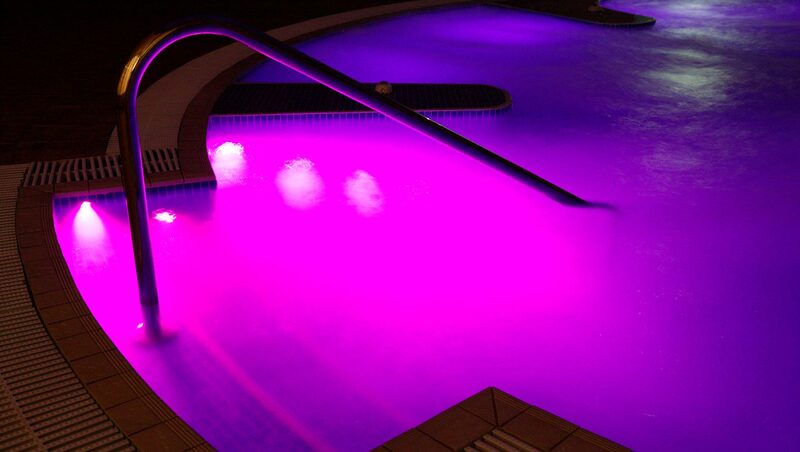 This is a very good-value spa, deservedly popular with locals and groups of friends. Whittlebury Hall is a grand, four-star Georgian hotel, conference and training centre near the Silverstone race track in the Northamptonshire countryside. The wide range of facilities includes two restaurants, a café overlooking a lawn, a bar, a golf course, and -- in a separate wing -- a leisure club and spa. After a short wait, staff welcomed us at the spa reception which has rattan armchairs and tables laden with fruit, iced water and magazines. We filled in a consultation form and received an envelope containing our spa itinerary and an electronic rubber band for the locker. We waited until a group formed for a tour of the spa. There are two sets of changing rooms which spa guests can use. 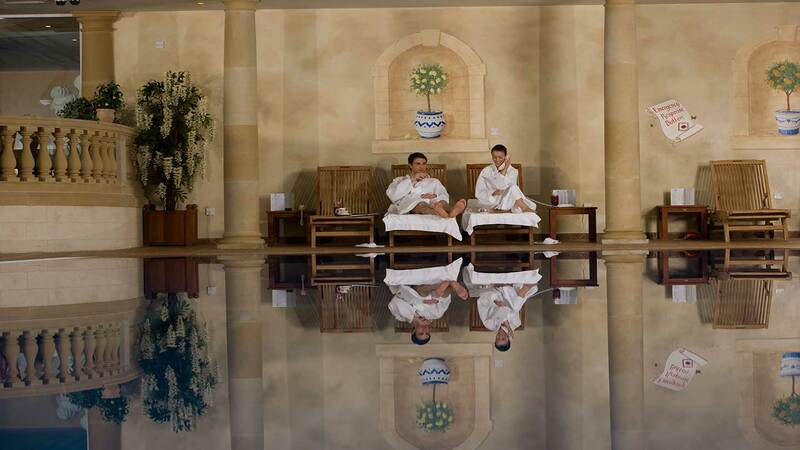 One is in the spa, home to the treatment rooms and the thermal facilities. The other is in the leisure club, which is open to leisure-club members, and contains the pool, café and gym. Hundreds of small wooden lockers stacked three or four high line the walls of the spa's changing rooms, each containing white waffle robes and towels (but no flip-flops or spa slippers; you can buy these from reception for £6). The changing area is small and, while four purple chaise longues sat in the centre, it was too busy to sit. There is no private changing room but guests were told they could change in the shower or toilet cubicle. For afterwards, there's a spin dryer and vanity area with two hairdryers and two straighteners. Around the corner are four showers with black, sparkly splashbacks, purple stools and unbranded shampoo, conditioner and body wash, plus three loos. The 19-metre pool in the leisure club has a strong Greek theme with wall paintings, stone pillars and even naked statues. The left-hand side of the pool is cordoned off for lap swimming -- check the website for children's swim times if you fancy a quiet dip -- while each corner is given over to bubbly Jacuzzis. Relax between swims on one of several brown rattan loungers lining three sides of the pool. We enjoyed the spa's heat and ice experience rooms which form a circle around the warm hydrotherapy pool, with its bubbles. We began our spa journey at the footbaths, using the time to survey all the rooms on offer and devise a spa journey. There are five heat experiences (caldarium, saunas, Roman salt steam room, sanarium and tepidarium) and three ice experiences (ice bucket, ice cave, experience showers -- select "very cold"). Each room is decked out in mosaic tiles and large enough for six to eight people. We sampled them in a clockwise direction, taking time out to cool down and relax in between. There are two saunas, the first reaching 60 and the second a hot 85 degrees. We followed the first with a trip to the ice cave -- where we rubbed handfuls of ice all over our hot bodies -- and the second with the daring ice bucket. The experience was invigorating. Perhaps the spa's best feature is the Whisper Room, with water beds, hanging egg chairs and lie-flat loungers all with faux-fur cushions and throws. Flickering candles and a hypnotic fish tank give a peaceful vibe. The leisure club also has a large fitness area with a good range of gym equipment and a fitness studio running several classes. Back in the spa, there is also a hair salon and mani/pedi area. My therapist Steph cheerfully greeted me in the light, airy, bright treatment area and guided me to one of the attractive and relaxing treatment rooms, furnished in cosy purples and beiges. Steph went through the consultation form, explained the treatment, and asked about areas of concern. I chose to go for a really firm massage to help recovery from a recent shoulder injury. Steph delivered this with a liberal supply of ESPA Restorative Oil with its relaxing scent of sweet orange, rose geranium and lavender. She applied strong pressure to knead out and untie months of knots and seemed to intuit how far to push it, so that the massage was effective but never painful. She also made sure at regular intervals during the treatment that I was happy. I certainly was! My aching nerves and muscles melted in her expert hands and I felt renewed and relaxed. After the deep-tissue experience, Steph used long soothing strokes all over my body. Her gentle scalp massage helped relieve the last of my tension and I was ready for a leisurely lie down in the relaxation room. The Spa at Whittlebury Hall also offers massages, scrubs, manicures, pedicures, facials, haircuts and dedicated treatments for men and mums-to-be. If you visit for a spa day, you can eat a buffet lunch in your robes at the Terrace Café in the busy leisure club, which would benefit from a decor update. The selection on our visit included a range of meat, fish, tasty salads and baked potatoes as well as hot choices such as tacos. All the dishes are labelled, with several choices for vegetarians and a few for gluten- and dairy-free guests. Tea, coffee and wine are extra and you need to order them from the bar. We piled our plates with tabbouleh, pasta salads and meat before going back up for a bowl of fruit salad with natural yoghurt. During the evening, we dined in the huge Aston's restaurant. Our trio of beef followed by Eton mess was filling. The treatment area: Compared to the rest of the spa, the treatment area is light, airy and serene. The Whisper Room is a particular highlight with warm waterbeds and a soothing atmosphere (although unfortunately, during our stay, work next door interrupted our calm). The customer service: The customer process felt a bit automated and depersonalised, but the staff themselves, especially our therapist, were all attentive, caring and helpful. The tired decor: Whittlebury is a lovely building and some areas are designed well. However, the carpets, upholstery and the general décor, particularly in the changing rooms and the leisure club, is a little dated and looks positively tired in places. The occasional feeling of being crowded and rushed: The small changing room got particularly busy in the morning of our visit, on a Monday. The lunch slots in the café are only 45 minutes and again the café can get busy. Hen parties (we saw at least one), bargain-hunters (it's good value) and golfers will all enjoy the Spa at Whittlebury Hall. 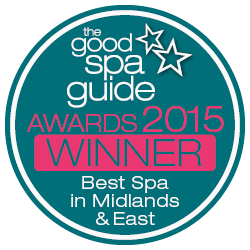 We awarded the Spa at Whittlebury Hall a Good Spa Guide Bubble Rating of 4 Bubbles. Whittlebury is good value, has lots to do, and enough facilities to keep you busy for hours. It's fun, busy and great for friends. Occasionally it feels a little too busy, especially in the changing rooms and in the leisure club café at lunchtime. As a result, the experience can feel a bit rushed and depersonalised. The décor could also do with updating. Super Spy visited in May 2018 and awarded it 4 Bubbles. "I was recovering from cancer treatment and I was made to feel welcome and at home with the specialist treatment on offer. The facilities are fantastic; the spa radiants a warm ambience, great selection of treatments available, good choice of products on offer in the shop and reasonably priced." "Amazing experience again and again. Perfect environment and facilities to help relax. I always leave feeling ready to take on the world!" "I go around 3-5 times a year. I absolutely love it. You can take classes, go to the gym, attend a tribute night or just read and relax. There is something for everybody." "I have been numerous times and it never fails to impress. I feel refreshed and raring to go!" The Terrace Café for light snacks and healthy spa cuisine; Astons Restaurant for informal all-day dining; Bentleys for a pizza and pasta menu; 2 AA rosette restaurant Murrays for fine dining. Standard Rooms, Club Rooms and Suites available, from £250 per room for a Standard Double with breakfast.